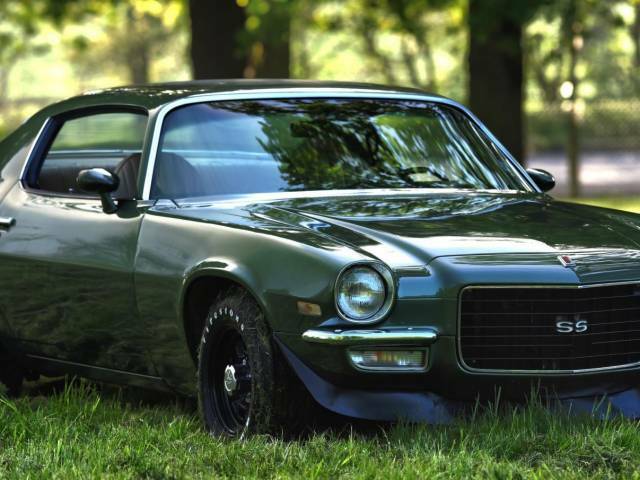 Vintage and Prestige are proud to offer this 1972 Chevrolet Camaro SS 396/402 4-Speed Muncie For Sale. Starting in 1970, the big block option actually displaced 402ci, but Chevy chose to retain 396 badging. Though heavily down on power for these final year “396” cars, liberating more isn’t difficult, and this one’s colors and condition are both excellent. Just 970 SS 396 cars were built for 1972, and of those, remaining, matching-numbers cars in good original condition can likely be counted on both hands. The earlier cars having a 396 Ci engine, this however being a later model is fitted with the 402 Ci Big Block engine. For sale is this very straight, very clean and very rare all original numbers matching Manual Transmission Big Block Camaro. This Camaro is equipped with its original 396/402 Big Block, 4-Speed aluminium cased Muncie M21 transmission and POSI Traction rear axle. This SS Camaro is one of, or the last manual big block Camaro ever produced by Chevrolet! This very classy vehicle drives extremely well and handles like new and is a pleasure to drive and is always complemented and admired by the fellow enthusiast.